Word suggestions from your Android making you unhappy? 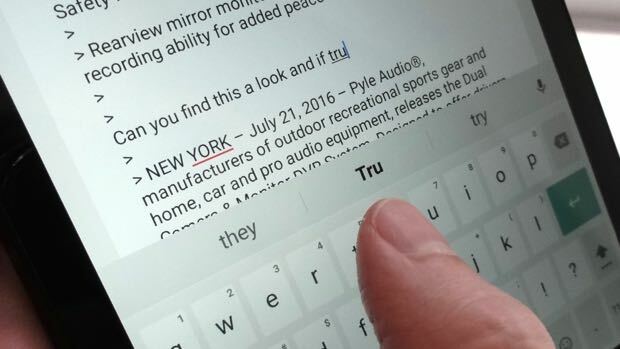 So you’re tapping (or swiping) away on your Android phone or tablet when you get yet another weird word suggestion—this time, “Tru” when you just wanted to type “true.” Ugh. Well, turns out there’s an easy (and gratifying) way to permanently delete a specific word from Android’s list of word suggestions. Just drag and drop the suggested word you want to delete into the “Remove suggestion” trash can. Just tap, hold, and drag the word out of the suggestions bar. When you do, you’ll see a trash can marked “Remove Suggestion” appear. Drag and drop the word into the trash can, and whoosh—the word will disappear, never to be seen in the suggestions bar again. Note: I tested this tip on a 2013 Nexus 7 tablet running Android version 6.0.1, using the “stock” Android Keyboard app. You can turn off word suggestions completely by tapping Settings, Language & input, Google Keyboard, Text correction, and then toggling off the “Show suggestions” setting.